Thread: Old Bacon Face makes Benny do a Keegan! 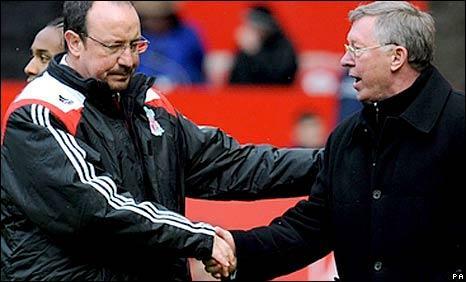 Liverpool boss Rafael Benitez has launched a furious attack on Manchester United counterpart Sir Alex Ferguson. Benitez claims that Ferguson is "the only manager who will not be punished" for verbally attacking referees. "We had a meeting about the Respect campaign and I was very clear - forget about it, because Mr Ferguson is killing the referees," said Benitez. "How can you talk about the Respect campaign and yet criticise the referee every single week?" Last edited by EmperorTud; 09-01-2009 at 10:38 PM.